'Interceptor' is in fact the desert car in the original and first Mel Gibson film about Mad Max. The trigger happy post-WWIII road warrior is nowhere to be seen, however, there's a new video game coming up and I believe that free publicity is just as good reason for a new album as any. 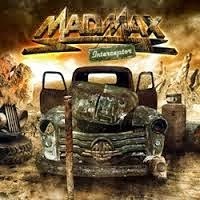 Mad Max, the band, was formed in 1981 in Münster, Germany, by guitarist Jürgen Breforth and I believe he's the only survivor and original band member since the war (WWIII). Lead vocalist and famed producer Michael Voss (Casanova, Demon Drive, MSG, etc.) joined the band when Andreas Bäsler decided to leave shortly after the recording of their self-titled debut. Produced by Voss at his own Kidpool Studio in Münster, with the drum recordings completed at the renowned Principal Studios in Senden. The record was mastered at the MSM Studios in Munich, and according to Breforth: "This time we made a conscious decision to allow ourselves more external output, yet without overdoing it". For instance, Herman Ze German - not the ancient Teutonic hero, but former Scorpions' drummer (Rarebell), responsible for the odd song credit as they've decided to let several outsiders have a go at co-writing. The majority of the songs are still pretty melodic and not to be confused with the heavy metal of the early 80s. Very quick track-by-track. The opening piece "Save Me", the decent Mad Max composition as it should be played, with feeling, passion, smashing guitar work and vocals. Sadly lacking the catchy hook. The following "Godzilla" with its larger than life agenda, as much fun as watching the old movies from Japan featuring the Monster. In other words, pretty boring stuff and merely the bridge is a keeper. Through the rest of their original material, there's the decent melody and guitar work that gives them added kick. "Sons Of Anarchy", very much the 80s sound of Dokken and Pretty Maids only lacking the great refrain. "Five Minute Warning", a fine semi-ballad which Breforth and Voss composed in Nashville in collaboration with American songwriter Van Preston. "Bring On The Night", main guitar riff ála Dokken and Lynch. "Streets Of Tokyo", the Herman Rarebell co-write and I'm told it's been inspired by their MSG Japan tour? Nontheless, decent party rock. "Show No Mercy", the re-recording of the bonus track from the 1987 album Night Of Passion. "Revolution", gritty guitar rock and finally, "Turn It Down", the obligatory and dare I say boring? cover song by The Sweet. Great production, vocals, and guitar work. Unfortunately a bit too safe in the long run.